Whether you are planning to add some annuals or perennials to the garden, or planning to impress someone you love on Valentines Day or any day, you will find a growing collection of floral ideas on this page to help you accomplish your mission. As I type this page, I am excited because even though the Ground Hog saw it's shadow today, I know that Spring starts next month. And shortly after that I will be able to get my hands in the soil to cultivate and add to my perennial gardens. I can't wait! As for romance, I used to love getting flowers for and from my husband. It was a loving give and take between us, showing our love for one another. This can happen any day, but definitely on Valentine's Day. 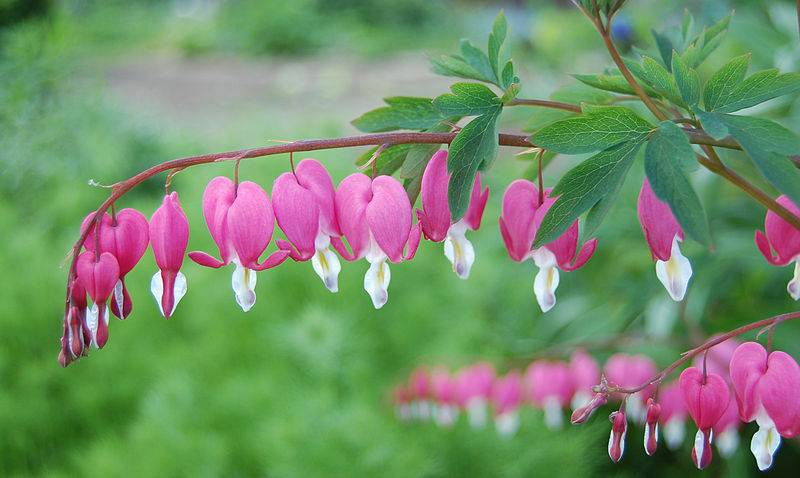 The Bleeding hearts or Lamprocapnos that I grow in my garden look like the ones on this page, pink, but they come in other colors, including red, yellow and white. The ones that have the most distinctive heart shape are the ones you see pictured here. Though I have never grown them from seeds, it can be done. I prefer getting a plant section from someone who is dividing plants they already have established in their garden, or buying a plant at our local garden center. The bleeding hearts that are in my garden right now were purchased at a garden shop in Lancaster, PA, owned by an Amish family. The plants are quite happy in areas that get a lot of shade. They are perennials, so will come up year after year if kept under the right conditions. 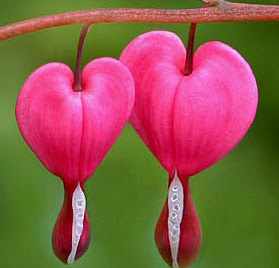 They don't require much care, I have a neighbor who doesn't tend to the garden very much and each year the Bleeding Hearts grow and bloom faithfully. Bleeding Hearts do well in hardiness zones 3-9. They like moist soil, but will survive going dry for a bit. In a month it will be March as I publish this page, the month that we celebrate St. Patrick's Day. 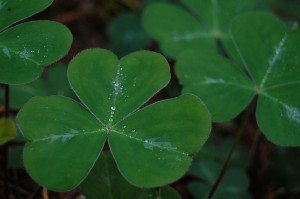 Have you ever noticed that each section of the Shamrock is shaped like a heart? 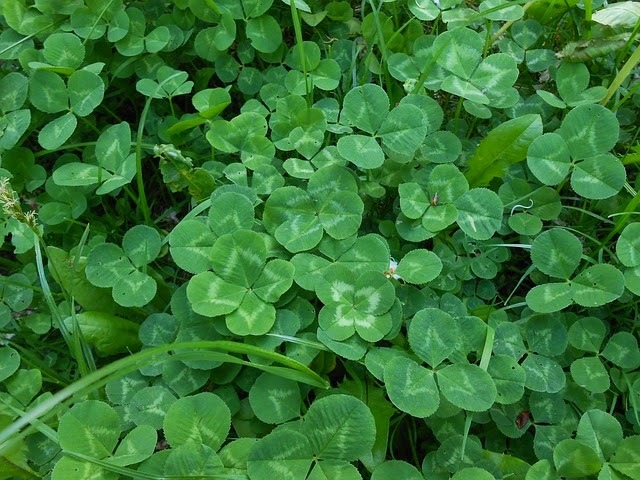 It is the heart-shape of each of the leaves that distinguishes it from the round-leaved clover that I am accustomed seeing in our lawn, though both are from the same family. Either way, you may enjoy a bit of luck if you find a four leaf clover or shamrock. Did you know that you can grow your own Shamrocks? You may enjoy doing this as a project with your children, or as a pretty table decoration for St. Patrick's Day. But first, can you find the 4 leaf clover in the image below? While you are looking, notice the difference in the shape of the leaves. Can you find the 4-leaf Clover in the picture below? 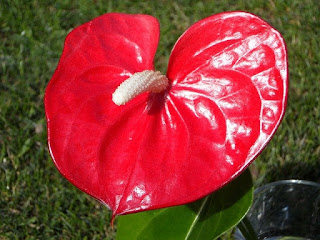 This is the Anthurium flowering plant. It grows in tropical locations like the islands of Hawaii. The flower feels as solid as it appears in pictures, almost like plastic. Florists often have these available and will put them in bouquets for you as they did for me in a Valentine's Day flower arrangement I had sent to my husband one year at work. You may enjoy trying to grow one if you have the right conditions in your part of the country, or a warm sunny spot in the home.